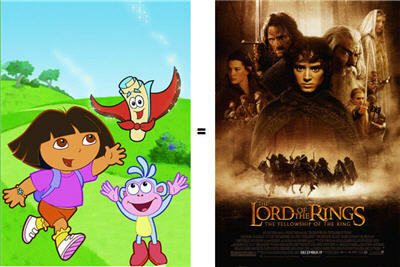 Dora the Explorer of the Rings | Kris Johnson's Blog…sort of. Not that much of a stretch really. @Scott Roche — Especially now that all of the shocking (yes, shocking!) evidence has been assembled and laid out for all the world to see. The lid’s been blown off this one, baby! There’s no putting this genie back in the bottle! What have you missed? I really couldn’t say as I would have to actually watch an episode or two of Dora the Explorer. And let’s face it, I’m just not ready for that sort of commitment. Btw, your cold hard smorgasbord of evidence has convinced me of this unpleasant truth. My eyes have been opened. Wide. @Natalie — We’re all about the enlightenment of the masses, here. Your head is a strange, weird, scary place, methinks. @The Bearded Goose — Oh, just wait until you see my Wonder Pets fan fiction. Well that settles it in my book! How can I argue with evidence like this? I shall ever after imagine Dora has hairy feet. @Nycteris — Boots, being a monkey, almost certainly has hirsute pies. Yes, pies is Spanish for “feet”. Let that percolate in your brain for a while and see if it doesn’t drive you absolutely loco.